Congratulations to the Brookfield 8th grade girls basketball team for winning the AAC Tournament Championship on Feb. 7 with a final score of 35-19 over LaBrae. Lady Warrior Bowlers are AAC Blue Tier Conference champions! Congratulations to the Lady Warrior Bowlers who won the AAC Blue Tier Conference Tournament on Sunday, Jan. 27 at Freeway Lanes. The Ladies were led by 3 top five finishers, Kelsie Hamilton with a 336, and second place overall, Emilee Bebech with a 327, good for third place overall, and Nikole Husnick finished 5th with a 266 series. This is the 3rd time in the last four years that the girls have won the tournament.They scored 1977 pins to edge out Champion who finished with 1959. The boys team finished in fourth place with 2020 set. Shawn Hitt bowled a 329 series to take second place overall. Rhys Knoxville rolled a 275 series to finish in the top ten. Golf Team wins the AAC Championship! 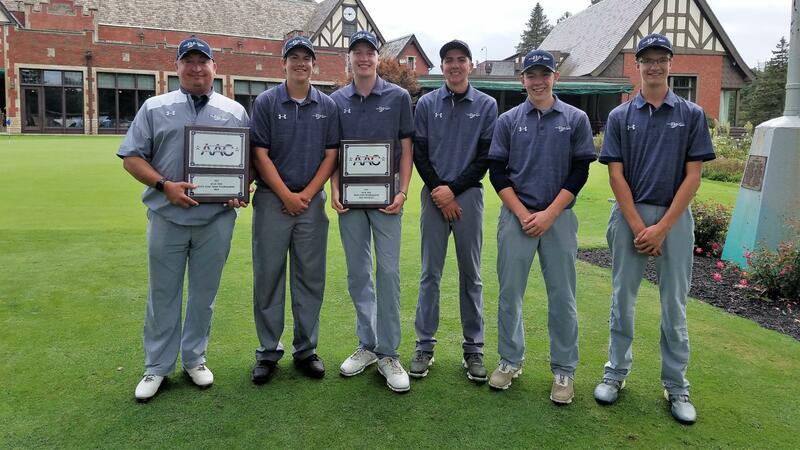 The golf team won the AAC championship on Tuesday, Sept. 11 at Youngstown CC. Their team total of 303 was 51 strokes better than the second place team. Conner Stevens was the medalist with a one under par round of 70. Justin Atkinson & Anthony Clark had 77 and Jake Shindledecker had 79 for the Warriors. The golf team won the 2018 OHSAA District Tournament on Thursday, Oct. 4 at Tannenahuf Golf Course in Alliance with a team score of 306. Justin Atkikson was the medalist with 72. Conner Stevens 74, Anthony Clark, 78, Jon Hiner 82 and Jake Shingledecker 84. All five Warrior golfers placed within the top 16 of the 53 player field. Brookfield defeated second place Canton Central Catholic by 27 strokes. For the third year is a row the Warriors will play in the OHSAA State Tournament next Friday and Saturday at NorthStar Golf Course in Columbus. The volleyball team won the OHSAA Sectional Championship by defeating Maplewood 3-0 on Thursday, Oct. 18. Bailey O'Brien had 17 assists, Olivia Vogel had 16 points and 5 aces, Bailey Drapola had 10 kills and 6 aces, Anna Reichart had 12 digs, Katie Rogers Vadala had 11 digs and Becca Litz had 9 digs for the Lady Warriors. The Lady Warriors will play Ashtabula St. John in the OHSAA District Semi-finals next Wednesday, Oct. 24 at 6:00 pm at Southington HS. Congratulations to Coach Larry Smoot and the golf team for their performance at the state golf tournament the weekend of Oct. 12. The Brookfield Warrior Golf Team is the OHSAA State Runner-up. Their team total of 617 was only seven strokes higher than Columbus Wellington who shot 610. Brookfield's total of 617 would have won the Div. II tournament by 8 strokes. On Saturday Brookfield had the Div. III state record for lowest team score of 309 for about an hour until that was broken by Columbus Wellington with a 295. Of the public schools in the Div. III tournament Brookfield was 56 shots better than their nearest public school competitor. 8th Grade Lady Volleyball Warriors are the AAC Champions! 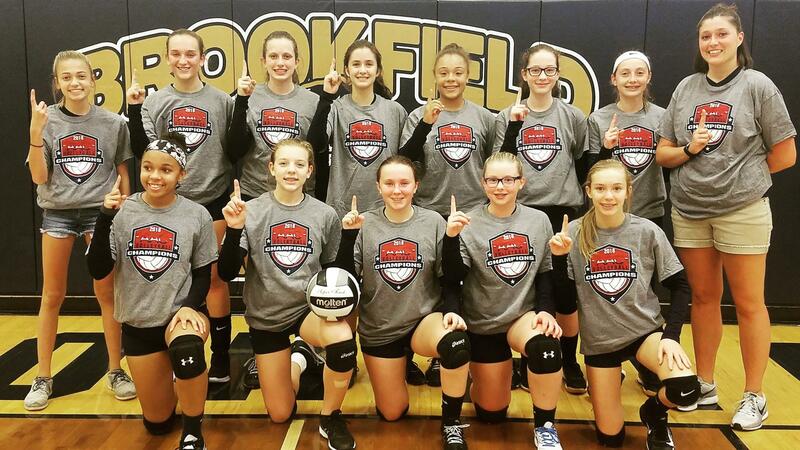 Congratulations to the 8th grade volleyball team for winning the AAC Championship on Tuesday, Oct. 9. They beat LaBrae 2-0. © 2019. Brookfield Local Schools. All Rights Reserved.